Does your day-to-day commute leave a lot to be desired? Do you need a little more than a humdrum drive when you get behind the wheel? 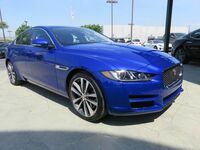 Few models will deliver like the 2018 Jaguar XE in San Antonio, TX. An exhilarating compact luxury sedan, the Jaguar XE possesses unrivaled engine options, a wealth of innovative technology, an athletic style and a luxurious interior at an affordable price. Visit Barrett Jaguar today to get behind the wheel of the 2018 Jaguar XE! When the updated 2018 Jaguar XE luxury sedan arrives at dealerships, it will be available in six trim levels - XE, XE Premium, XE Prestige, XE R-Sport, XE S and the all-new XE Portfolio. Entry-level Jaguar XE 25t trim levels start at just $35,725 and will deliver limitless thrills and luxury when you get behind the wheel. Highlight features of the Jaguar XE include a standard eight-inch InControl Touch touchscreen display, on-board Wi-Fi connections, premium leather interior, heated and cooled front seats and much more. Power, speed and performance are key attributes of the 2018 Jaguar XE in San Antonio, TX that make the compact luxury sedan stand out from the crowd. Base Jaguar XE editions play host to a 247-horsepower 2.0-liter turbocharged four-cylinder power core that is mated to an eight-speed automatic transmission and will shell out 269 pound-feet of torque. Equipped with the standard turbocharged four-cylinder engine, the Jaguar XE will sprint from zero to 60 mph in just 6.0 seconds. Are you looking for the perfect combination of power and fuel economy? An available 2.0-liter turbodiesel four-cylinder engine will deliver. Capable of manufacturing 180 horsepower and 318 pound-feet of torque, the diesel-powered Jaguar XE luxury sedan will reach a top speed of 120 mph. Matched with an eight-speed automatic transmission, the diesel Jaguar XE will make 32 mpg in the city and 42 mpg on the highway. Drivers who desire pure power and speed can upgrade to the 340-horsepower 3.0-liter supercharged V-6 powerhouse. Married to an eight-speed automatic, the supercharged Jaguar XE will sprint from zero to 60 mph in just 5.1 seconds. Fuel-economy ratings for the high-powered Jaguar XE stand at 21 mpg in the city and 30 mpg on the highway. Available all-wheel drive will further amplify your drive when you get behind the wheel of the Jaguar XE. Take performance to the next level when you slide into the driver’s seat of the 2018 Jaguar XE S trim level. With a modified 3.0-liter supercharged V-6 under the hood, the Jaguar XE S will deliver 380 horsepower to the wheels. Elite performance-tuned Jaguar XE models will vault you from zero to 60 mph in just 4.9 seconds when you hit the accelerator. Experience the power and thrills of the 2018 Jaguar XE firsthand when you visit Barrett Jaguar in San Antonio! 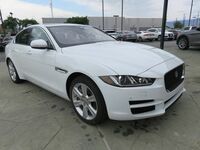 Interested in a 2018 Jaguar XE?